This weekend was what some consider to be the biggest CW contest of the year. It appears the last time I attempted this contest (or at least submitted a log) was in 2011 and I made 19,266 points. I guess that’s my goal but I know I can easily beat that so I bumped it to 250k. Since I did over 1 million in SSB, I should at least do 250k… right? Yep, I still have a lot of trouble decoding CW with my head. But that is not going to stop me from trying. 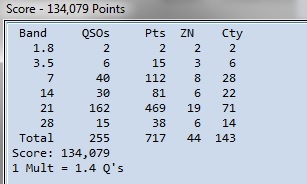 I think contesting is beneficial when it come to learning even though I don’t think CQWW should be the place to do it. But I did it anyway. I entered as “assisted” meaning that I will be using the skimmer/cluster/network or whatever you want to call it to help make contact with other ops. What I am doing is depending on other people and/or software that will decode those calling CQ and letting me (the network) know exactly where they are. That’s perfect for me because if I have an idea of what the callsign will be, It’s much easier to make the contact. I used two different networks to show me who and where the other operators are. One such network is the spotting network. Think of it as an online chatroom where other operators tell you where other operators are on the bands as they make contact. Most likely their logging software is setup to send out a message whenever contact is made automatically. Other people using similar software will take that information and display it on a chart where the operator could click on the spot and the logbook would partially fill out and the radio could even tune to it. The software might even color code the spots to let you know if that operator is a multiplier that you need to make contact with. It’s been in use for a long time now and many contesters take advantage of it to increase rates since you are no longer have to search for a signal. The other network I used is what is known as the Reverse Beacon Network (RBN) or “Skimmer”. Its similar to the spotting network except it’s fully automated. It’s not depending on human input. There are hundreds of Software Defined Radio (SDR) rigs throughout the world listening to the bands. A popular piece of software known as “CW Skimmer” will listen to the bandwidth of the SDR and decode any CW signal being sent using a sophisticated algorithm based on Bayesian statistics. If the skimmer picks up anyone sending “CQ” or “Test” or other keywords, it will note the callsign, frequency, sending speed, and even signal strength and send it along to RBN or it’s own network which will end up on your screen if it’s supported and enabled. I use RBN to usually test to see how far my CW signal can be heard. It’s great for testing out the various CW kits I’ve built. It tells me the Signal to Noise Ratio (SNR) and it’s another confirmation that I am indeed on frequency. In contesting both RBN and the Spotting network can help. However it will most likely put you into a different category. There is some controversy over using the networks and some consider it flat out cheating since you are being fed information that could give you an advantage compared to the operator that is not using the network and having to manually search for their contacts. However it’s becoming more accepted. There is one big problem with using the either network. You can never trust it… ever. With the spotting cluster, you are depending on other people. Those people might not have copied the callsign correctly or there are some evil doers out there that will send out false contacts in hopes to mess you up. The RBN is even less trusting. I don’t think software decoding will ever be perfected to match the experienced human ear. Even though it’s extremely impressive when you look more into it, there is still a lot of bad spots coming from RBN. Even though I wouldn’t trust both, it’s a very useful tool if you want high scores and rates. If it wasn’t for these networks, I wouldn’t be looking forward to CW contesting. I hope I do enough CW to where I can do some contests without having to use the networks. I’m entering as SOAB(A)LP which means Single Operator, All Bands, Assisted and using Low Power. When it comes to digital and CW contests, I just don’t trust my amplifier so I run low power. The contest starts at 7pm local on Friday night. However there is a VE exam the same night and I would prefer to be there instead of being on the air. After the exam, I went on 40m and 80m, made a handful of contacts and went to bed. When I woke up on Saturday and got on the air, EU was booming in on 15m so I spent most of my time on there. My Yagi is tuned for SSB so CW contesting is a no-no since my tuner is not inline with the beam. I could have hooked it up but it’s something I didn’t want to do. That basically cancels out the CW portion of 10m and most of the CW portion of 20 using the beam. I did 20m and 40m off my vertical and kept the G5RV on 80m. Not really feeling this contest so I didn’t put much effort into rates. Sunday wasn’t any better. I couldn’t hear much on 10m so I stuck to 15m with the occasional trip to 20m. Towards the end of the contest I was excited to make contact with Alaska and Hawaii since I need LoTW confrimations for Worked All States Triple Play Award. Those contacts and some JA contacts made me very happy. My CW decoding improved greatly towards the end of the contest. Even though I was still using the cluster, I was able to confirm the calls much faster. Caught a lot of busted calls much easier. I ended up making 255 contacts with 143 band countries and 44 band zones which gives me a total of 134,079 points. I spent about 7 hours on the air. I didn’t reach my 250k but I shattered my 2011 score and I had a good time. Hopefully I get some new countries confirmed and I hope AK and HI confirm as well. I just love how much faster CW contesting is compared to SSB. At least it felt that way for me. I am sure it would become better and faster after I really learn CW.